The journey has been arduous and fraught with disappointment, but it appears we've finally reached our destination. Welcome to The Golden Age of Compact Motoring. Gone are the days of mostly cheap and poorly executed C-segment entries. Ye Olde "It's the Honda Civic, Toyota Corolla and everybody else" mindset is finally history, too. 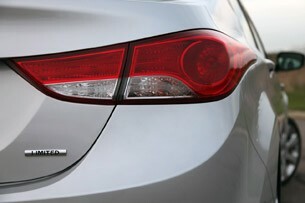 All of a sudden, new car buyers can choose from a bumper crop of smart new motors, including the all-new Civic, the 2011 Chevrolet Cruze, the 2012 Ford Focus, the larger and more affordable 2011 Volkswagen Jetta and the always entertaining Mazda3. And that's not all – there's also a new wildcard in the compact segment, the 2011 Hyundai Elantra. While entries like the Cruze and Focus have garnered lots of attention, the Elantra has quietly established itself as a worthy alternative in this suddenly competitive segment. The redesigned Hyundai caught our attention with its expressive styling, an improved cabin and 40 miles per gallon highway rating. 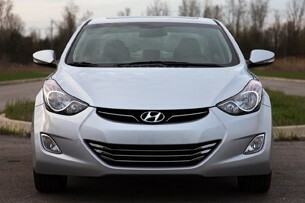 It sounds like a winning game plan to us, but does this revitalized Hyundai live up to its impressive stat sheet? 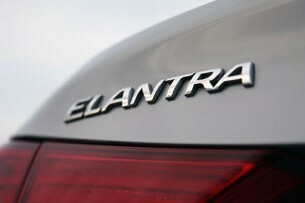 We spent a week with an Elantra Limited to find out for ourselves. 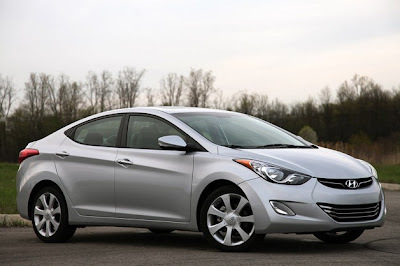 The 2011 Elantra utilizes the same "Fluidic Sculpture" design language of its larger Sonata sibling, with a sleek profile that includes a coupe-like roofline and pronounced crease that spans the side body panels. 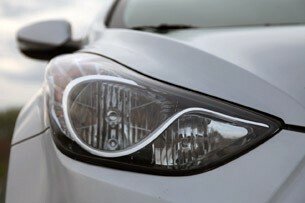 Up front, the vehicle features a pair of large, stylized headlights and a rounded lower fascia opening framed up by a pair of well-placed fog lamps. The rear looks equally attractive, with an almost hatch-like profile and a pair of taillights that are every bit as imposing as the peepers up front. A range-topping Limited example like our tester is rounded out with 17-inch aluminum wheels mated to Continental P215/45R17 tires. From the outside, the Elantra couldn't look more different than its milquetoast predecessor, but we're just as impressed with what Hyundai designers have done to transform a formerly bland and nondescript cabin. Climbing into the Elantra is no longer like a trip to Accountant World, where the rides are forgettable and the imagination nonexistent. In place of drab scenery and ho-hum materials, Hyundai designers have added plenty of aesthetic flair, with interesting instrument panel lines that draw the eye towards a well laid-out center stack. 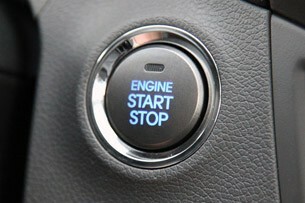 Dash materials are cushy and nice to touch, while the leather-wrapped steering wheel falls easily to hand. Admittedly, the leather covering the seats isn't of the highest quality, but these chairs are very comfortable and surprisingly well bolstered. We can live with less than luxury-level leather, especially when considering our loaded tester's reasonable MSRP of $22,110. Besides, the Elantra Limited comes standard with heated seats for front and rear passengers, so our leather-backed bums will be grateful when the weather turns cold. $22,110 is a very competitive price for a top trim compact these days – a bit less expensive than a comparably equipped Focus ($23,680 for SEL model with moonroof and navigation) or Civic ($25,754 for EX-L model equipped with 17-inch wheels). Ergonomics in the cabin have been well thought-out, with everything available to the driver without the need to reach very far. We especially liked the HVAC controls – it's nice to heat or cool the cabin without having to take your eyes off the road to hunt for the right button or setting. The Elantra also deserves kudos for a quiet interior that makes holding conversations with rear seat occupants easy. These are the sorts of touches that make a compact sedan feel less like an econobox and more like a luxury rig. 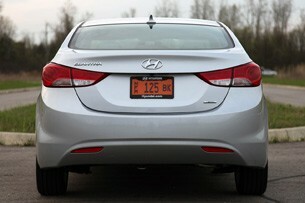 The Elantra Limited we tested also featured Hyundai's optional Technology Package, which stickers for $2,100. 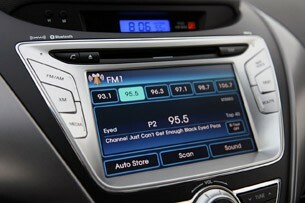 The Elantra Limited already comes equipped with Bluetooth connectivity and USB and auxiliary ports for a smartphone or MP3 player, but the Tech Package adds a seven-inch LCD touch screen with navigation, rear-view camera, 360-watt sound system and push button start. That's a lot of kit for a reasonable package price, and we found the technology intuitive to use and easy to understand. While we generally have few complaints concerning the Elantra's interior, we'd be remiss if we didn't mention the discount switchgear all around. 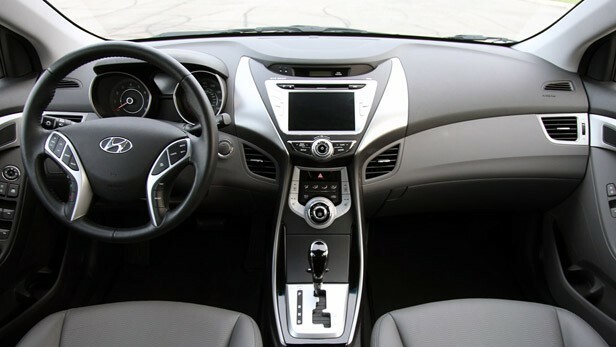 If you park, say, a Focus next to the Elantra Limited and scrutinize the switchgear and power window controls, the Focus clearly features superior equipment. We'd also like a few more inches of legroom for rear seat passengers, as 33.1 inches is less than nearly every major competitor. Finally, we were also a bit turned off by the oddly placed black accents on the doors. They didn't match the gray tone of the dashboard and were hard on the elbows. Rear legroom was probably the biggest issue we had with the Elantra's cabin, but we remain more interested in what happens from directly behind the steering wheel. The story begins with a 1.8-liter four-cylinder rated at 148 horsepower and 131 pound-feet of torque. Buyers have a choice of a six-speed manual (GLS model only) or the six-speed automatic transmission that comes standard when specifying the Limited trim. The 1.8-liter and automatic combo performs well together, with smooth shifts and plenty of power to spin the front wheels of this 2,877-pound sedan. If you're thinking that nearly 2,900 pounds is a bit heavy for a compact car, we don't disagree, but the Elantra is actually one of the leaner entries in its class. The good news is that the base $14,995 GLS model is over 200 pounds lighter. And besides, even with the extra tonnage, the Elantra Limited still feels peppy off the line, with an estimated 0-60 time under nine seconds. The figure certainly isn't land-speed record material, but it's more than fine for an inexpensive runabout, and the quiet cabin makes it all seem less harried. 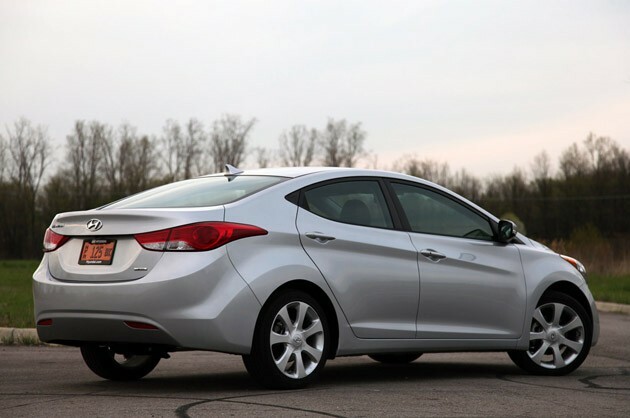 Some compacts have developed a reputation for offering a sporty ride and handling, but while the Elantra certainly looks the part, this Hyundai is in practice more of a comfy cruiser than an expert corner carver. The front suspension consists of MacPherson struts with coil springs, while the rear hardware is comprised of a torsion axle with gas-filled, hydraulic monotube shocks. Sportier rides tend to feature a multi-link setup out back, but going the torsion beam route lets Hyundai keep prices down and still supply a compliant ride. 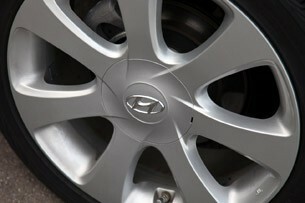 The Elantra does feel tight enough, though, with little body roll and plenty of grip. While we can live with its less-than-sporty chassis, we can't as easily dismiss its brake or steering feel (or lack thereof). In the case of the latter, we've sampled plenty of electronically controlled setups, but the Elantra's helm seems to lack an actual connection to the road. The wheel does have a bit of heft to it, but the weighting feels artificial. 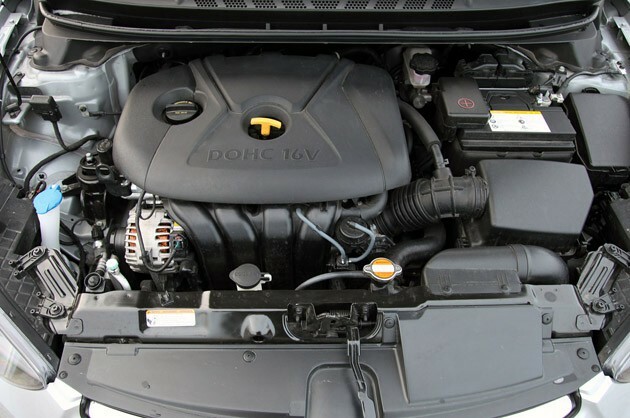 While there are plenty of new and renewed competitors in this segment, none can boast an EPA rating of 40 miles per gallon across their entire model range. Hyundai is hanging its hat on the fact that competitors must resort to special high-fuel economy models or diesel power to net the big 4-0 on the highway, and they've been positively champing at the bit to remind you that whether you purchase a manual or automatic, every Elantra boasts 29 mpg in city driving and 40 mpg on the highway. That's impressive, but when the rubber met the road, we were only able to average about 31 mpg during our week of mixed driving with the car. That's still rock-solid, but a bit below the EPA's combined estimate of 33 mpg. To be clear, if you're the type of driver that prioritizes a sporty feel and sharp handling, there are more appropriate places to spend your money in this segment. Hyundai has taken a calculated bet aimed squarely at the fat part of the compact car buying bell curve, prioritizing fuel economy, styling, technology and an attractive price tag over backroad thrills. The Korean automaker may have neglected the enthusiast niche here, but it only takes a passing glance to know that Hyundai is serious about the compact sedan segment. While we're still hoping for an inexpensive drive with a bit more flavor, the new Elantra's off-to-the-races sales figures suggest that Hyundai is definitely on to something.